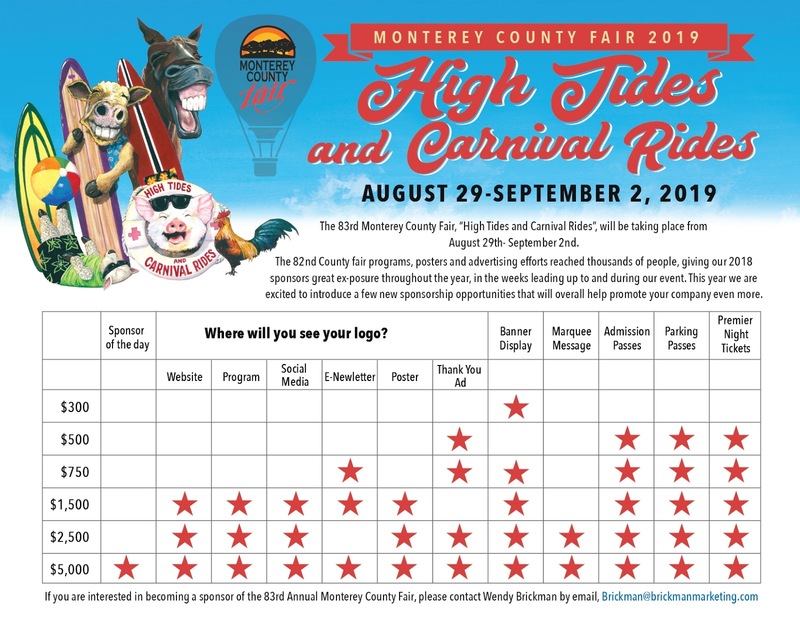 The Monterey County Fair, celebrating its 83rd year this year, is seeking sponsors for the fair, set for Aug. 29 through Sept. 2, 2019, at the Monterey County Fair & Event Center. Monterey, CA, April 02, 2019 — The Monterey County Fair, celebrating its 83rd year this year, is seeking sponsors for the fair, set for Aug. 29 through Sept. 2, 2019, at the Monterey County Fair & Event Center. Sponsorships range from $5,000 to $300. For the $5,000 level, company logos will be included on the following: Sponsor of the day, Website, Program, Social Media, eNewletter, Poster, Thank-You Ad, Banner Display, Marquee Message, Admission Passes, Parking Passes, and Premier Night Tickets. The next level, $2,500, includes all of the above, except Sponsor of the day and e-Newsletter, and so forth. Other levels are $1,500, $750, $500 and $300. If you are interested in becoming a sponsor of the 83rd Annual Monterey County Fair, please contact Wendy Brickman by email, Brickman@brickmanmarketing.com. Attention Monterey County! Show off your talents! 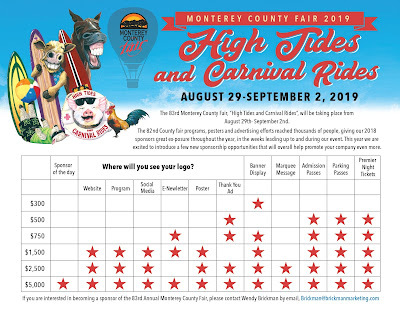 Local performers and those who wish to showcase their talents for free are being sought to appear on the Community Stage at the 83rd Annual Monterey County Fair, which will be held Aug. 29-Sept. 2, 2019. Monterey, CA, April 02, 2019 — Attention Monterey County! Show off your talents! Local performers and those who wish to showcase their talents for free are being sought to appear on the Community Stage at the 83rd Annual Monterey County Fair, which will be held Aug. 29-Sept. 2, 2019. Interested individuals and organizations are invited to apply online no later than Friday, June 28, 2019, at www.montereycountyfair.com. 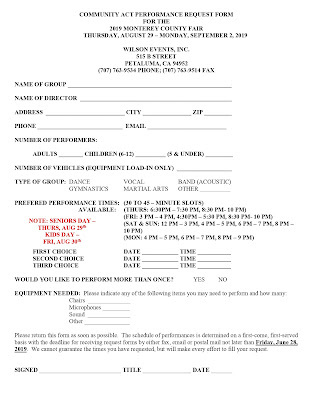 There you will find a “Community Act Performance Request Form” to fill out with your pertinent data, type of group, equipment needed, when you would like to perform, etc. 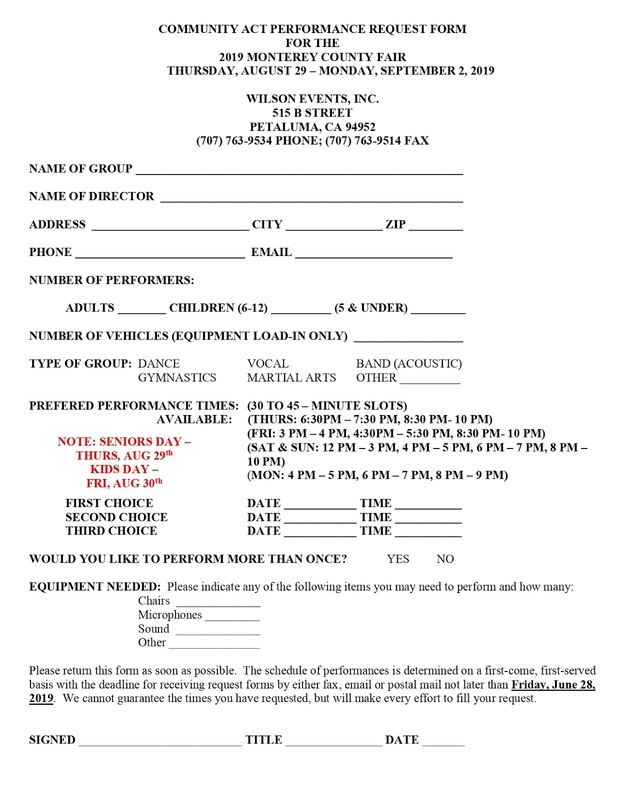 The schedule of performances is determined on a first-come, first-served basis with the deadline for receiving request forms by either fax, email or postal mail no later than June 28. The fair cannot guarantee the times requested, but will make every effort to fill your request. The Monterey County Fair & Event Center is a premier event center set on 22 oak-studded acres. It is home of the annual Monterey County Fair, host to many major public and private events on the Central Coast, and the site of the Monterey Bay Race Place, a satellite wagering facility. The Monterey County Fair is the 7th District Agricultural Association of the State of California. For more information, call (831) 372-5863 or check out the website, www.montereycountyfair.com.